The Exiles will soon return in a new series by writer Saladin Ahmed, artist Javier Rodriguez and colorist Jordie Bellaire. But who are the Exiles? The Marvel Report has your “Exiles 101” lesson ready! The “Exiles” are a team made up of individuals from throughout the multiverse who work together to correct problems (“hiccups”) that threaten the timelines of the different universes. The book idea was inspired by the Marvel What If… titles that look at alternate versions of Marvel history. 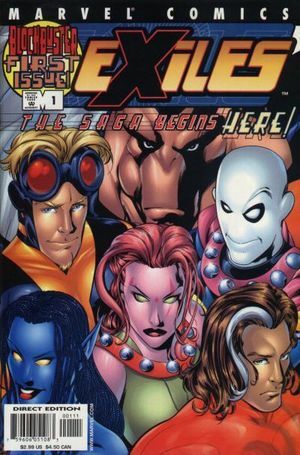 The original Exiles team featured Blink (Clarice Ferguson from Earth-295 who was featured in “Age of Apocalypse”) and versions of Nocturne, Thunderbird, Mimic, Morph and Magnus (shortly replaced by Sunfire). Towards the beginning of the run, the Exiles are brought together and employed by a mysterious figure called the Timebroker who sends the team on missions to fix broken realities. They later discover another team hired by the Timebroker called “Weapon X,” who they often clash with. While the team eventually breaks away from the Timebroker after his true intention is revealed in a later story arc, the series continues to focus on the team and their adventures across the multiverse throughout the run. The book occasionally intersected with the main universe, including during the “House of M” storyline. However, for the most part, the book was able to play outside of continuity. The first series ran for a lengthy 100 issues before its end in 2007. Despite the title’s initial popularity, the subsequent relaunches didn’t fare as well. New Exiles, by writer Chris Claremont and artist Tom Grummett, launched in March 2008. It featured a team of Sabretooth, Shadowcat, Morph, Sage, Rogue, Psylocke and Mystique and ran for only 18 issues before cancellation. The series was relaunched again with a new #1 by writer Jeff Parker and artist Salvador Espin in April 2009. This team featured Blink and alternate versions of Black Panther, Scarlett Witch, Forge, Polaris, and Beast. It only lasted six issues, and that was the end of the Exiles. That is until Marvel announced its decision to relaunch the title in 2018. Read on to the next page to learn about the new team launching in Exiles #1 (2018). Pingback: REVIEW: Exiles #1 – "Protect the Multiverse"